The Official Website for Flavorstone! The Only Cookware You'll Ever Need! Our Best Selling Gemstone-Tough Sapphire Non-Stick Pans: Fry, Bake, Roast, Sauté & So Much More! Change the Way You Cook? 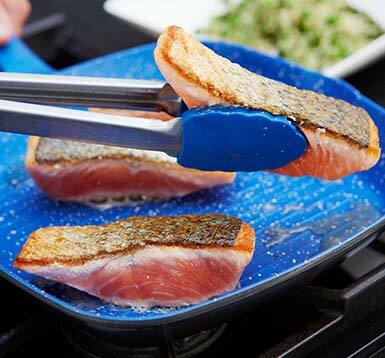 A Unique Non-stick Surface that Virtually Eliminates Cooking Messes! You’ll rethink the way you can cook healthy, low-fat meals, AND clean your pans. Healthy Cooking is Now Fast and Easy! FlavorStone’s non-stick surfaces are perfect for healthy cooking. No Sticking and No Mess! With features like 7.62cm tall stirfry walls and a dome-shaped lid with built in steam vent, your favorite food’s natural flavor is locked in without the extra fat and calories from additional cooking aids like oil and butter. Enjoy your favorite meals with the same great taste guilt free! Cooking Will Never Be The Same! Save Energy! 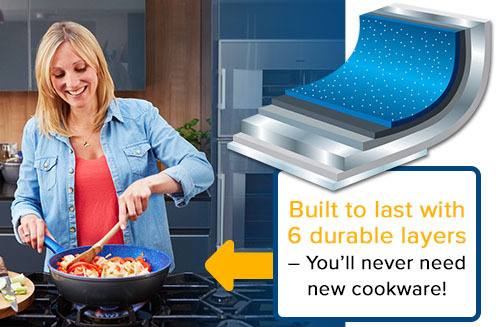 No Pan "Hot-spots" Heats evenly and with lower temperatures, saving you money on energy bills! You only need a medium heat setting or lower. Nothing Sticks! Utensils won’t scratch! Cook without butter or oil with delicious results & easy clean up. Quick One-Swipe Cleaning No more soaking pans overnight. Cleans in one swipe, and is also dishwasher safe!! your foods cook evenly, and you spend less time slaving over a hot stove top. Save Energy and Money on Energy Bills! You only need a medium heat setting or lower. Light-weight and balanced, FlavorStone® pans are manufactured using a multi-ply construction process. This technique is designed to ensure even heat disbursement throughout the entire cooking area. The Reviews Are In – Everybody Is Loving FlavorStone®! "These have to be the easiest pots & pans I have ever used in my life!" "The Espanola Tortilla just slid out!" "It basically just needs a wipe of a cloth." "The FlavorStone® cookware comes with full cleaning and care instructions. The Pans are dishwasher friendly, however you will find that its so easy to clean." FlavorStone® Pans Work Great on Gas, Electric, Ceramic and Induction Cooktops! FlavorStone® and associated logos and variations are trademarks or registered trademarks, in the U.S. and/or other countries, of Thane International, Inc. and/or its subsidiaries.